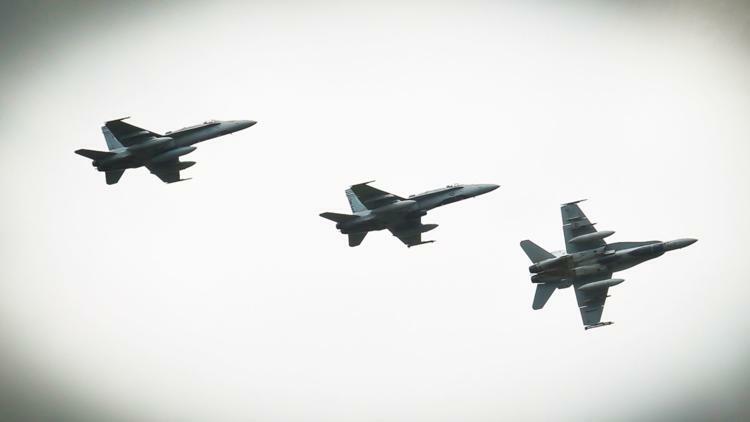 F/A-18C Hornet aircraft fly over Marine Corps Air Station Beaufort Sep. 13. The Blue Blasters of Strike Fighter Squadron 34 will return to Oceana on Wednesday. F/A-18 Super Hornets will begin to reposition to areas inland beginning Wednesday. VIRGINIA BEACH, Va. (WVEC) — About 75 aircraft will leave Naval Air Station Oceana to avoid possible damage related to Hurricane Florence. F/A-18 Super Hornets will begin to reposition to areas inland beginning Wednesday, and are assigned to Strike Fighter Squadrons 106 (VFA-106), the “Gladiators”, the “Fighting Blacklions” of VFA-103, and the “Pukin’ Dogs” from VFA-143. Later in the day Wednesday, other aircraft assigned to NAS Oceana will also depart. Planes undergoing maintenance will remain behind in their hangers. Meanwhile, aircraft assigned to Joint Base Langley-Eustis in Hampton have begun to relocate to Ohio, while ships at Naval Station Norfolk have sortied out to sea in advance of the oncoming storm.